Republican Congressman Steve King says if Mexico fails to stop a caravan of asylum seekers from Central America who’re headed north, then President Trump must follow through on his threat to send troops to seal the southern border and prevent their entry in the United States. Recent reports indicate the caravan, which started in Honduras, has swelled to a group of 4000 making their way through Guatemala. King says President Trump must also carry out his threat to end U.S. aid to countries along the migration route if the caravan reaches the U.S. border. 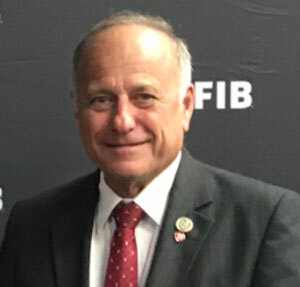 King, who is seeking a ninth term in the U.S. House, has long advocated building a wall along the southern border and he has strongly opposed legislation to provide a pathway to citizenship or some sort of legal residency status for immigrants who’ve entered the country illegally. This past week, King sparked controversy by commenting on Canadian politics. King tweeted his endorsement of Faith Goldy, who’s running for mayor of Toronto. The election is next week. “I support her because she won’t back up, she takes a stand and she holds it and she has been badly abused by the establishment in Toronto,” King says. King says Goldy is “a legitimate candidate” whose advertising wasn’t aired and who was not invited to debate the other two candidates running for mayor of Toronto.